Located in the center of downtown Hartford, Feng Asian Bistro and Lounge offers a broad range of elegant Southeast Asian dishes, spanning the Pacific Rim from Japan, China and Thailand. We offer fresh and traditional Japanese sushi and Asian fusion creations made using the freshest, quality ingredients. Our chefs combine flavors and seasoning, fusing the styles of the East and West in every dish, while still exemplifying authenticity. This creative, eclectic mix is sure to please anyone’s palate. At Feng Asian Bistro and Lounge, our atmosphere is a mix of urban and global, coming together to create an elegant yet casual space, perfect for a gathering of friends and family or a more intimate couple’s night out. We welcome you to join us for a fresh, delicious meal, and we hope to see you soon! 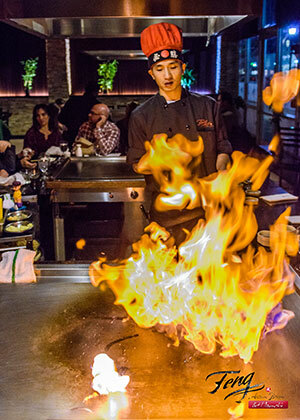 Feng Asian Bistro and Lounge has been serving Hartford since 2005. Our mission is to provide delicious cuisine with a fusion of flavors in every bite in an elegant, unpretentious environment. With over ten years of success, we look forward to adding you to our long history of happy customers.